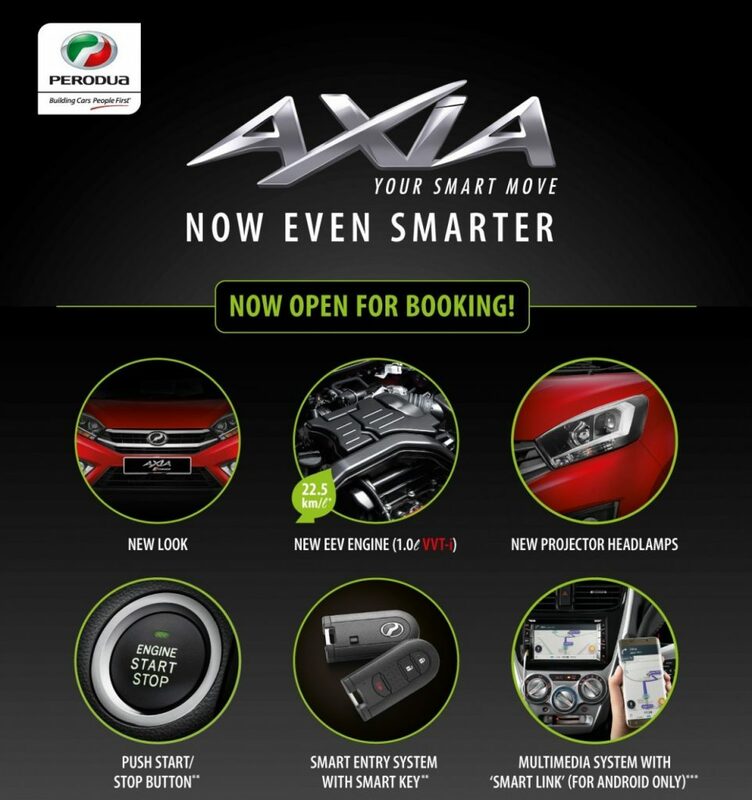 Perodua has announced that the soon-to-be launched Axia facelift, that will come with a new Variable Valve Timing with intelligence (VVT-I) engine – an improvement compared to its current KR Engine as well as improved features, is now open for booking. The new engine with VVT-I will further boost the Axia’s fuel efficiency up to 22.5km/litre in Eco-Driving mode, compared to the current 21.6km/litre (manual transmission). 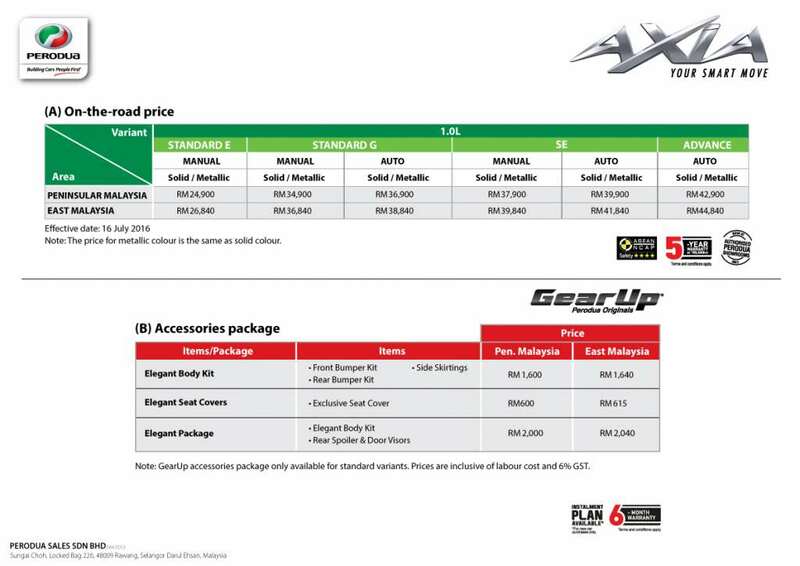 “The Axia has been our best-selling model since 2014 and we believe that the added value included in these new variants would be able to sustain the public’s interest for this model,” Perodua Sales Sdn Bhd Managing Director, Dato’ Dr. Zahari Husin said. Perodua has sold 214,700 Axia since it was launched in September 2014 which makes the Axia Malaysia’s No.1 EEV. In 2016, the entry level compact car sold 85,900 units. “We target the Perodua Axia to have an average sales volume of 6,000 units a month,” Dato’ Dr. Zahari said. Among the major improvements found on the Axia Standard variant includes new styling for the front grill and bumper, backdoor handle, a new seat fabric design, as well as the inclusion of projector headlamps. On the entertainment system, the Perodua Axia Standard-G audio now comes equipped with a USB port. For the Axia SE and Advance variants, a number improvements which is available as standard features include new styling front grille and bumper; push start button; smart entry with smart key; multimedia system with ‘Smart Link’ (for android only); new design projector headlamps; new chrome door outer handles; spiral design alloy wheels; backdoor handle; new seat fabric design (for SE); and meter-combi with new white illumination. The Perodua Axia (Standard) will be available in Ivory White, Glittering Silver, Ebony Black and Midnight Blue colour. The Lemongrass Green and Cherry Blossom colour that were introduced during its launch in September 2014 have been dropped. The SE and Advance Version variants will come with two additional colours compared with the Axia Standard-G; which are Solid Sunflower Yellow and Metallic Lava Red. “Despite the added value we included in this Perodua Axia facelift, we have kept the price range affordable for all Malaysians”, said Dato’ Dr. Zahari. “We welcome the public to visit our 182 sales showrooms nationwide and to speak to our authorised sales advisors about the new Axia facelift,” he added.